This oversized soup mug is a must have for all you soup lovers. Its basic stylish and classy design allows you to cozy up and enjoy up to 3 cups at a time of your favorite soup. 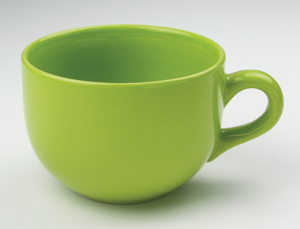 It’s a ceramic mug that is microwave safe so feel free to reheat your favorite soups. Buy 7 and save 15% with Store Wide Discounts. Buy 12 and save 20% with Store Wide Discounts. This mug is exactly what I hoped for--oversized, but graceful, quality ceramic in a beautiful color. This is perfect for soups and chili and will serve for cappucinos and hot chocolate with plenty of room for foam, whipped cream and marshmallows. I bought a selection of these in different colors. My order arrived quickly and all my "breakables" were very well packed for shipping. They arrived in perfect condition. Of the four that I ordered, this is my favorite. The color is fresh & bright, was exactly as it appeared on my monitor. We use the mugs almost daily and the quality seems to be excellent.